The Camerons or clan Chameron belong to the district comprehended under the old Maormordom of Moray. According to John Major, the clan Cameron and the clan Chattan had a common origin, and for a certain time followed one chief; but for this statement there appears to be no foundation. Allan, surnamed MacOchtry, or the son of Uchtred, is mentioned by tradition as the chief of the Camerons in the reign of Robert II; and, according to the same authority, the clan Cameron and the clan Chattan were the two hostile tribes between whose champions, thirty against thirty, was fought the celebrated combat at Perth, in the year 1396, before King Robert III with his nobility and court. The Camerons, says a manuscript history of the clan, have an old tradition amongst them that they were originally descended from a younger son of the royal family if Denmark, who assisted at the restoration of Fergus II in 404; and that their progenitor was called Cameron from his crooked nose, a name which was afterwards adopted by his descendants. "But it is more probable", adds the chronicler, "that they are the aborigines of the ancient Scots or Caledonians that first planted the country"; a statement which proves that the writer of the history understood neither the meaning of the language he employed, nor the subject in regard to which he pronounced an opinion. As far back as can distinctly be traced, this tribe had its seat in Lochaber, and appears to have been first connected with the house of Isla in the reign of Robert Bruce, from whom, as formerely states, Angus Og received a grant of Lochaber. Their more modern possessions of Lochiel and Locharkaig, situated upon the western side of the Lochy, were originally granted by the Lord of the Isles to the founder of the clan Ranald, from whose descendants they passed to the Camerons. This clan originally consisted of three septs, - the Camerons or MacMartins of Letterfinlay, the Camerons or MacGillonies of Strone, and the Camerons or MacSorlies of Glennevis; and from the genealogy of one of these septs, which is to be found in the manuscript of 1450, it has been inferred that the Lochiel family belonged to the second, or Camerons of Strone, and that being thus the oldest cadets, they assumed the title of Captain of the clan Cameron. Mr Skene conjectures that, after the victory at Perth, the MacMartins, or oldest branch, adhered to the successful party, whilst the great body of the clan, headed by the Lochiel family, declared themselves independent; and that in this way the latter were placed in that position which they have ever since retained. But however this may be, Donald Dhu, who was probably the grandson of Allan MacOchtry, headed the clan at the battle of Harlaw, in 1411, and afterwards united with the captain of the clan Chattan in supporting James I when that king was employed in reducing to obedience Alexander, Lord of the Isles. Yet these rival clans, though agreed in this matter, continued to pursue their private quarrels without intermission; and the same year in which they deserted the Lord of the Isles, and joined the royal banner, viz 1429, a desperate encounter took place, in which both suffered severely, more especially the Camerons. Donald Dhu, however, was present with the royal force at the battle of Inverlochy, in the year 1431, where victory declared in favour of the Islanders, under Donald Balloch; and immediately afterwards his lands were ravaged by the victorious chief, in revenge for his desertion of the Lord of the Isles, and he was himself obliged to retire to Ireland, whilst the rest of his clan were glas to take refuge in the inaccesible fastness of the mountains. It is probably from this Donald Dhu that the Camerons derived their patronymic appellation of MacDhonuill Duibh, othewise MacConnel Duy, "son of Black Donald". But their misfortune did not terminate here. The Lord of the Isles, on his return fromcaptivity, resolved to humble a clan which he conceived had so basely deserted him; and with this view, he bestowed the lands of the Camerons on John Garbh Maclean of Coll, who had remained faithful to him in every vicissitude of fortune. This grant, however, did not prove effectual. The clan Cameron, being the actual occupants of the soil, offered a sturdy resistance to the intruder; John Maclean, the second laird of Coll, who had held the estate for some time by force, was at length slain by them in Lochaber; and Allan, the son of Donald Dhu, having acknowledged himself a vassal of the Lord of Lochalsh, received in return a promise of support against all who pretended to dispute his right, and was thus enabled to acquire the estates of Locharkaig and Lochiel, from the latter of which his descendants have taken their territorial denomination. By a lady of the family of Keppoch, this Allan, who was surnamed MacCoilduy, had a son, named Ewen, who was captain of the clan Cameron in 1493, and afterwards became a chief of mark and distinction. Allan, however, was the most renowned of all the chiefs of the Camersons, excepting, perhaps, his descendant Sir Ewan. He had the character of being one of the bravest leaders of his time, and he is stated to have made no less than thirty-five expeditions into the territories of his enemies. But his life was too adventurous to last long. Inthe thirty-second year of his age he was slain in one of the numerous conflicts with the Mackintoshes, and was succeeded by his son Ewan, who acquired almost the whole estates which had belonged to the chief of the clan Ranald; and to the lands of Lochiel, Glenluy, and Locharkaig, added those of Glennevis, Mamore, and others in Lochaber. After the foreiture of the last Lord of the Isles, he also obtained a feudal title to all his possessions, as well those which he had inherited from his father, as those which he had wrested from the neighbouring clans; and from this period the Camerons were enabled to assume that station among the Highland tribes which they have ever since maintained. The Camerons having, as already stated, acquired nearly all the lands of the clan Ranald, Ewen Allanson, who was then at their head, supported John Moydertach, in his usurption of the chiefship, and thus brought upon himself the resentment of the Earl of Huntly, who was at that time all-powerful in the north. Huntly, assisted by Fraser of Lovat, marched to disposses the usurper by force, and when their object was effected they retired, each taking a different route. Profiting by this imprudence, the Camerons and Macdonalds pursued Lovat, against whom their vengeance was chiefly directed, and having overtaken him near Kinloch-lochy, they attacked and slew him, together with his son and about three hundred of his clan. Huntly, on learning the defeat and death of his ally, immediately returned to Lochaber, and with the assistance of William Mackintosh, captain of the clan Chattan, seized Ewen Allanson of Lochiel, captain of the clan Cameron, and Ranald Macdonald Glas of Keppoch, whom he carried to the castle of Ruthven in Badenoch. Here they were detained for some time in prison; but being soon afterwards removed to Elgin, they were there tried for high treason, and being found guilty by a jury of landed gentlemen, were beheaded, whilst several of their followers, who had been apprehended along with them, were hanged. This event, which took place in the year 1546, appears to have had a salutary effect in disposing the turbulent Highlanders to submission, the decapitation of a chief being an act of energy for which they were by no means prepared. The subsequent history of the clan Chameron, until we come to the time of Sir Ewan, the hero of the race, is only diversified by the feuds in which they were engaged with other clans, particularly the Mackintoshes, and by those incidents peculiar to the times and the state of society in the Highlands. Towards the end of Queen Mary's reign, a violent dispute having broken out amongst the clan themselves, the chief, Donald Dhu, patronymically styled Macdonald Mhic Ewen, was murdered by some of his own kinsmen; and, during the minority of his successor, the Mackintoshes, taking advantage of the dissensions which prevailed in the clan, invaded their territories, and forced the grand-uncles of the young chief, who ruled in his name, to conclude a treaty respecting the disputed lands of Glenluy and Locharkaig. But this arrangement being resented by the clan, proved ineffectual; no surrender was made of the lands in question; and the inheritance of the chief was preserved undiminished by the patriotic devotion of his clansmen. Early in 1621, Allan Cameron of Lochiel, and his son John, were outlawed for not appearing to give security for their future obedience, and a commission was issued to Lord Gordon against him and his clan; but this commission was not riqorously acted on, and served rather to protect Lochiel against the interference of Mackintosh and others, who were very much disposed to push matters to extremity against the clan Chameron. The following year, however, Lochiel was induced to submit his disputes with the family of Mackintosh to the decision of mutual friends; and by these arbitrations, the lands of Glenluy and Locharkaig were adjudged to belong to Mackintosh, who, however, was ordained to pay certain sums of money by way of compensation to Lochiel. But, as usually happens in similar cases, this decision satisfied neither party. Lochiel, however, pretended to acquiesce, but delayed the completion of the transaction in such a way that the dispute was not finally settled until the time of his grandson, the celebrated Sir Ewan Cameron. About the year 1664, the latter, having made a satisfactory arrangement of the long-standing feud with the Mackintoshes, was at length left in undisputed possession of the lands of Glenluy and Locharkaig; and, with some trifling exceptions, the various branches of the Camerons still enjoy their ancient inheritances. The family of Lochiel, like many others, was constrained to hold its lands of the Marquis of Argyll and his successors. Sir Ewan Cameron, commonly called Ewan Dhu of Lochiel, was a chief alike distinguished for his chivalrous character, his intrepid loyalty, his undaunted courage, and the ability as well as heroism with which he conducted himself in circumstances of uncommon difficulty and peril. This remarkable man was born in the year 1629, and educated at Inverary Castle, under the guardianship of his kinsman the Marquis of Argyll, who, having taken charge of him in his tenth year, endeavoured to instil into his mind the political principles of the Covenanters and the Puritans, and to induce the boy to attach himself to that party. But the spirit of the youthful chief was not attempered by nature to receive the impressions of a morose fanaticism. At the age of eighteen, hebroke loose from Argyll, with the declared intention of joining the Marquis of Montrose, a hero more congenial to his own character. He was too late, however, to be of service to that brave but unfortunate leader, whose reverses had commenced before Cameron left Inverary. But though the royal cause seemed lost he was not disheartened, and having kept his men in arms, completely protected his estate from the incursions of Cromwell's troops. In the year 1652, he joined the royal standard in the Highlands, and greatly distinguished himself in a series of encounters with General Lilburne, Colonet Morgan, and others. In a sharp skirmish which took place between Glencairn and Lilburne, at Braemar, Lochiel, intrusted with the defence of a pass, maintained it gallantly until the royal army had retired, when Lilburne, making a detour, attacked him in flank. Lochiel kept his ground for some time; until at last finding himself unable to repel the enemy, who now brought up and additional force against him, he retreated slowly up the hill, showing a front to the assailants, who durst not continue to follow him, the ground being steep and covered in snow. This vigorous stand saved Glencairn's army, which was, at that time, is a disorganised state; owing principally to the conflicting pretensions of a number of independent chiefs an gentlemen, who, in their anxiety to command, forgot the duty of obedience. Lochiel, however, kept clear of these cabals, and stationing himself at the outposts, harassed the enemy with continual skirmishes, in which he was commonly successful. How his services were appreciated by Glencairn we learn from a letter of Charles II to Lochiel, dated at Chantilly, the 3d of November, 1653, in which the exiled king says, "We are informed by the Earl of Glencairn with what courage, success, and affection to us, you have behaved yourself in this time of trial, when the honour and liberty of your country are at stake; and therefore we cannot but express our hearty sense of this your courage, and return you our thanks for the same". The letter concludes with an assurance that "we are ready, as soon as we are able, signally to reward your service, and to repair the losses you shall undergo for our service". Acting in the same loyal spirit, Lochiel kept his men constantly on the alert, and ready to move wherever their service might be required. In 1654, he joined Glencairn with a strong body, to oppose Generals Monk and Morgan, who had marched into the Highlands. Lochiel being opposed to Morgan, a brave and enterprising officer, was often hard pressed, and sometimes nearly overpowered; but his courage and presence of mind, which never forsook him, enabled the intrepid chief to extricate himself from all difficulties. Monk tried several times to negotiate, and made the most favourable proposals to Lochiel on the part of Cromwell; but these were uniformly rejected with contempt. At length, finding it equally impossible to subdue or to treat with him, Monk established a garrison at Inverlochy, raising a small fort, as a temporary defence against the musketry, swords, and arrows of the Highlanders. General Middleton, who had been unsuccessful in a skirmish with General Morgan, invited Lochiel to come to his assistance. Upwards of 300 Camerons were immediately assembled, and he marched to join Middleton, who had retreated to Braemar. In this expedition, Lochiel had several encounters with Morgan; and, notwithstanding all the ability and enterprise of the latter, the judgement and promptitude with which that chief availed himself of the accidents of the ground, the activity of his men, and the consequent celerity of their movements, gave him a decided advantage in this guerre de chicane. With trifling loss to himself, he slew a considerable number of the enemy, who were often attacked both in flank and rear when they had no suspicion that an enemy was within many miles of them. An instance of this occurred at Lochgarry in August 1653, when Lochiel, in passing northwards, was joined by about sixty or seventy Athole-men, who went to accompany him through the hills. Anxious to revenge the defeat which his friends had, a short time previously, sustained upon the same spot, he planned and executed a surprise of two regiments of Cromwell's troops, which, on their way southward, had encamped upon the plain of Dalnaspidal; and although it would have been the height of folly to risk a mere handful of men, however brave, in close combat with so superior a force, yet he killed a number of the enemy, carried off several who had got entangled in the morass of Lochgarry, and completely effected the object of the enterprise. But all his exertions proved unavailing. Middleton, being destitute of money and provisions, was at length obliged to submit, and the war was thus ended, excepting with Lochiel himself, who, firm in his allegiance, still held out, and continued to resist the encroachments of the garrison quartered in his neighbourhood. He surprised and cut off a foraging party, which, under the pretence of hunting, had set out to make a sweep of his cattle and goats; and he succeeded in making prisoners of a number of Scotch and English officers, with their attendants, who had been sent to survey the estates of several loyalists in Argylshire, with the intention of building forts there to keep down the king's friends. This last affair was planned with great skill, and, like almost all his enterprises, proved completely successful. But the termination of his resistance was now approaching. He treated his prisoners with the greatest kindness, and this brought on an intimacy, which ultimately led to a proposal of negotiation. Lochiel was naturally enough very anxious for an honourable treaty. His country was impoverished and his people were nearly ruined; the cause which he had so long and bravely supported seemed desperate; and all prospect of relief or assistance had by this time completely vanished. Yet the gallant chief resisted several attempts to induce him to yield, protesting that, rather than disarm himself and his clan, abjure his king, and take the oaths to an usurper, he would live as an outlaw, without regard to the consequences. To this it was answered, that, if he only envinced an inclination to submit, no oath would be required, and that he should have his own terms. Accordingly, General Monk, then commander-in-chief in Scotland, drew up certain conditions which he sent to Lochiel, and which, with some slight alterations, the latter accepted and returned by one of the prisoners lately taken, whom he released upon parole. And proudly might he accept the terms offered to him. No oath was required of Lochiel to Cromwell, but his word of honour to live in peace. He and his clan were allowed to keep their arms as before the war broke out, they behaving peaceably. Reparation was to be made to Lochiel for the wood cut by the garrison of Inverlochy. A full indemnity was granted for all acts of depredation, and crimes committed by his men. Reparation was to be made to his tenants for all the losses, cess, and public burdens which had not been paid, were to be remitted. This was in June 1654. Lochiel with his brave Camerons lived in peace till the Restoration, and during the two succeeding reigns he remained in tranquil possession of his property. But in 1689, he joined the standard of King James, which had been raised by Viscount Dundee. General Mackay had, by orders of King William, offered him a title and a considerable sum of money, apparently on the condition of his remaining neutral. The offer, however, was rejected with disdain; and at the battle of Killiecrankie, Sir Ewen had a conspicuous share in the success of the day. Before the battle, he spoke to each of his men, individually, and took their promise that they would conquer or die. At the commencement of the action, when General Mackay's army raised a kind of shout, Lochiel exclaimed, "Gentlemen, the day is our own; I am the oldest commander in the army, and I have always observed something ominour or fatal in such a dull, heavy, feeble noise as that which the enemy has just made in their shout". These words spread like wildfire through the ranks of the Highlanders. Electrified by the prognostication of the vetern chief, they rushed like furies on the enemy, and in half an hour the battle was finished. But Viscount Dundee had fallen early in the fight, and Lochiel, disgusted with the incapacity of Colonel Cannon, who succeeded him, retired to his eldest won. This heroic and chivalrous chief survived till the year 1719, when he died at the age of ninety, leaving a name distinguished for bravery, honour, consistancy, and disinterested devotion to the cause which he so long and ably supported. The character of Sir Ewan Cameron was worthily upheld by his grandson, the "gentle Lochiel", though with less auspicious fortune. The share which that gallent chief had in the ill-fated insurrection of 1745-46 and his conduct throughout was such to gain him the esteem and admiration of all. The estates of Lochiel were of course included in the numerous forfeitures which followed the suppression of the insurrection; however, Charles Cameron, son of the Lochiel of the '45, was allowed to return to Britain, and lent his influence to the raising of the Lochiel men for the service of the government. His son, Donald, was restored to his estates under the general act of amnesty of 1784. The eldest son of the latter, also named Donald, born 25th September 1796, obtained a commission in the Guards in 1814, and fought at Waterloo. He retired from the army in 1832, and died 14th December 1858, leaving two sons and four daughters. His eldest son, Donald, succeeded as chief of the clan Cameron. The family of Cameron of Fassifern, in Argyleshire, possesses a baronetcy of the United KIngdon, conferred in 1817 on Ewan Cameron of Fassifern, the father of Colonel John Camerson, of the 92d Highlanders, slain at the battle of Quatre Bras, 16th June 1815, while bravely leading on his men, for that officer's distinguished military services; at the same time, two Highlanders were added as supporters to his armorial bearings, and several heraldic distinctions indicating the particular services of Colonel Cameron. On the death of Sir Ewan in 1828, his second son, Sir Duncan, succeeded to the baronetcy. BADGE: Dearcag fithich (empitium nigrum) crowberry. SLOGAN: Chlanna nan con thigibh a so �s gheibh sibh feoil. PIBROCH: Locheil�s March, also Ceann na drochait mohr. IN all the Highlands there is no clan more famous at once for valour and chivalry than Clan Cameron. Their deeds of bravery in the Great Glen and out of it are not marked by the bloody ruthlessness which characterises so much West Highland story, and alike for the chivalry with which he took up the cause of Prince Charles Edward when it seemed a forlorn hope, and for the influence which he exercised on the Highlanders during the entire rebellion, the Gentle Lochiel, as he was called, of that time remains on the page of history a type of his family and race. The name Cameron signifies Crooked Nose, and the story of the founder of the race remains embedded in the traditions of the West Highlands. In a corrupted form that story may be found in the opening chapter of James Ray�s Compleat History of the Rebellion of 1745, and the present writer has heard it direct from the shepherds� firesides in Lochaber. The tradition runs that the first of the Camerons was not a Gael, but of British or Cymric race, and came originally from Dunbartonshire. Being a "bonnie fechter" he was engaged in many quarrels, and in one of these suffered the disfigurement which gave him the name which he handed on to his descendants. Dunbartonshire having become too hot for him, he made his way to far Lochaber. There the Chief of the MacFhearguises was at the time in danger of being overcome by a neighbouring clan with which he was at feud. He welcomed the stranger, and made him the offer of his daughter�s hand and a fair estate for his assistance. This offer Cameron accepted, and, having vanquished his host�s enemies, found a settlement in the neighbourhood which his descendants have retained to the present day. A quaint part of the tradition as detailed by Ray is that, at a critical stage of his adventure, Cameron betook himself to his old nurse at Dunbarton. This dame, who was a noted witch, furnished her foster-son with a parcel of thongs, which she told him to tie to a fox�s tail. This fox he was to let loose, and all the land it should run over on its escape should become his. Further, it would be converted to the same sort of territory as the last which the thongs touched on his father-in-law�s estate. The sequel may be given in Ray�s own words. "That Cameron might have a good estate as well as a large one he let the fox loose upon a fine meadow just bordering upon MacDonald of Glengarry�s estate, expecting to have all the promised land and that it would consist of fine meadows. The charms were performed with great ceremony, and the fox turned out as the old woman directed; and, that he might travel the faster and take the course they desired, they set dogs after him The creature, glad of his liberty, and willing to preserve his life, endeavoured to elude their chase by running into a little brook which passed through the meadow where he was set at liberty. The dogs then entirely lost him, and he kept along the channel till he came to the estate of Glengarry. Water being the last thing the enchanted thongs touched, as fast as the fox ran the land was overflowed, so that in the space of a few hours all the country for several miles together became one continued loch. The MacDonalds, affrighted at this sudden inundation, such of them as had time to escape removed their habitations higher up into the mountains, and left the lake and the adjacent hills to be peaceably enjoyed by Cameron and his followers. What became of the fox, or where he stopped, history does not relate, but from this origin it is called Lochiel, or the Lake of Thongs, from which the Chief of the Camerons takes his title." According to Ray, the founder of the name was Sir Hugh Cameron, and the chronicler is good enough, notwithstanding his strong prejudice against everything Jacobite, to say that there had been "a constant succession of great men down from Sir Hugh, Knight of the Wry Nose, to the present Lochiel, famous in the late Rebellion." From a later warrior, Donald Dhu, who flourished in the end of the fifteenth century, the Clan has also been known as the Race of Donald the Black, and it is from this ancestor that the usual Christian name of the chiefs of the present day is derived. There is also a tradition that Lochiel is not the eldest branch of the family, this having been known as the Clan MacGillean Obhi, an heroic tribe mentioned in some of the early poetic fragments ascribed to Ossian. According to this tradition, Lochiel acquired the family property in Lochaber by marriage with the MacMartins of Letterfinlay. The family genealogies assert that the actual ancestor of the Cameron chiefs was Angus who married a sister of Banquo, Thane of Lochaber, slain by Macbeth in the eleventh century, and present a long line of chiefs descended from this worthy, who distinguished themselves highly in the wars and other historic events of the country. One of the most famous and desperate of the feuds in which the Camerons were engaged was that with Clan Chattan in the end of the fourteenth century, concerning the lands of Glenluie and Loch Arkaig, to which MacIntosh, the chief of Clan Chattan, laid claim. In the course of this feud the Camerons penetrated as far as Invernahaven at the junction of the Truim and the Spey. There they were met by MacIntosh at the head of a force of MacIntoshes, MacPhersons, and Davidsons. Just before the battle a dispute took place between the Davidsons and MacPhersons, who each claimed the post of honour, the right to lead the host. MacIntosh decided the delicate question in favour of the Davidsons, and as a result Cluny MacPherson in indignation withdrew his men. Thus weakened, Clan Chattan was defeated by the Camerons. That night, however, Macintosh sent to the camp of the MacPhersons one of his bards, who treated the sullen clansmen to a poem in which their conduct in retiring from the fight was attributed, not to their sense of honour, but to their cowardice. This so infuriated the MacPhersons that they made a surprise attack upon the Camerons, whom they defeated and pursued with great slaughter to the confines of Lochaber. One of the results of this encounter remains among the most famous episodes in Scottish history. The MacPhersons and the Davidsons proceeded to fight out their claims to precedence with cold steel, and presently the uproar among the clans became so great that the King sent the Earls of Crawford and Dunbar to quell it. In the end it was agreed that the matter should be decided by a combat between thirty men on each side, and the upshot was the famous battle within barriers on the North Inch of Perth, fought before King Robert III. in 1396. Among those who fought on the side of Donald, Lord of the Isles, at the battle of Harlaw in 1411, was John Cameron of Lochiel. The Camerons, however, afterwards found themselves at feud with the Island Lords, and in this feud suffered most severely, and were brought almost to extinction. It was in this emergency that the famous Chief, Donald Dhu, already referred to, achieved fame. Along with his son, the still more famous Alan Cameron, he restored the clan to a state of prosperity. Alan obtained from the Crown feudal charters of the lands of Loch Arkaig and Lochiel, to which the MacDonalds of Clan Ranald had laid claim, and by this means dealt a blow at these Lords of the Isles which materially helped their downfall. The same Chief engaged in another feud with the MacIntoshes. At a later day he supported Ian Mudertach when that warrior assumed the chiefship of Clan Ranald, and he fought alongside the MacDonalds at Glen Lochy in 1544, when they defeated and killed Lord Lovat with nearly all his followers. In consequence of this last achievement the Earl of Huntly was sent into Lochaber with an overwhelming force, and, seizing Lochiel and MacDonald of Keppoch, carried them to Elgin, where they were both beheaded. Sixty-seven years later, still another disaster befell the Camerons. In the course of his mission to carry justice and pacification into the West Highlands, the Earl of Huntly had obtained certain rights of superiority over Lochiel�s lands, and in 1594, when the Earls of Huntly and Errol, representing the Roman Catholic faction in the country, were making a stand against the Government, Lochiel�s forces were ranged upon their side. The Camerons fought on that side at the battle of Glenlivat, where the Earl of Argyll, commanding the Protestant forces, was overthrown. For his distinguished share in this battle Lochiel was outlawed, and lost part of his estate, which was never afterwards recovered. Nine years later Argyll attempted to wrest the superiority of the Camerons� lands in Lochaber from Huntly, Lochiel having agreed to become his vassal. On this occasion a number of the Camerons threw off their allegiance to Lochiel and entered into a plot to take his life. The Chief, however, laid an ambush for the plotters, slew twenty of them, and captured other eight. Again, for this, the Cameron Chief was outlawed, and Lord Gordon, Huntly�s son, invading Lochaber, seized him, and imprisoned him at Inverness. Perhaps the most famous of all Highland chiefs was Sir Ewen Cameron of Lochiel. Born in 1629, and brought up by the covenanting Marquess of Argyll as a sort of hostage for his clan, he afterwards took the side of King Charles I. When Cromwell�s forces overran the country, after the battle of Dunbar, Lochiel held stoutly out against them. Twice with greatly inferior forces he defeated the English invaders, and so continually did he harass the garrison at Inverlochy that he kept it in a state of siege till the Governor was glad at last to accept peace on Lochiel�s own terms. The Chief accordingly marched to Inverlochy with pipes playing and banners flying. He was received with a guard of honour, entertained to a feast, and, on giving his word of honour to live in peace, was not only granted an indemnity for the crimes and depredations committed by his clan, but had all the loss sustained by his tenants made good, and received payment for the woods on his property which had been destroyed by the Inverlochy garrison. The story is told how in time of these fights Lochiel found himself in death grips with a gigantic English officer. They lay on the ground together, neither of them able to reach his weapon. At last the Englishman saw his chance, and reached out to recover his sword. As he did so he exposed his throat, and this the Chief in his extremity seized with his teeth and held till his opponent�s life was extinct. When upbraided at a later day with the savage act, he declared it was the sweetest bite he had ever tasted. It is this Chief who is said to have slain with his own hand the last wolf ever seen in the Highlands of Scotland, and his hardihood may be gathered from the story that on one occasion, when sleeping out in the snow, having observed that one of his Sons had rolled together a snowball for a pillow, he rose and kicked away the support, exclaiming, "Are you become so womanlike that you cannot sleep without this luxury?" It is told of him that on one occasion at a later day he attended the court of James VII. to obtain pardon for one of his clan. The King received him with honour, and granted his request; then, purposing to make him a Knight, asked him for his own sword in order to give special point to the honour. But the Sword was so rusted with the long rainy journey from Scotland that Lochiel found it impossible to draw it from its scabbard, whereupon, overwhelmed with shame before the courtiers, he burst into tears. The King, however, with ready tact, consoled him. "Do not regard it, my faithful friend," he said, "had the Royal cause required it your Sword would have left the scabbard promptly enough." He then gave the Chief the accolade with his own royal weapon, which he forthwith bestowed upon him as a gift. A day came when Lochiel had an opportunity of proving the King�s saying true. At the Revolution, when the Royal Standard was raised in the Highlands by Viscount Dundee, he joined the Jacobite army with his clan, and fought at Killiecrankie. After urging Dundee to give battle, with the words, "Fight, my lord, fight, if you have only one to three!" he himself charged bareheaded and barefooted in front of his men, and contributed largely to the victory. He lived, however, to see great changes, and died in 1719, at the age of ninety, never, after all, having lost a drop of blood in any of the fights in which he had been engaged. The son of this Chief joined the Earl of Mar�s rising in 1715, and was forfeited for doing so, and it was his son again�the grandson of Sir Ewen�who was the Gentle Lochiel of 1745. But for him it is likely that the clans would never have risen for Prince Charles Edward. Courageous and loyal, with the highest sense of honour, he was held in the greatest esteem in the Highlands. When he went to meet the Prince at Borrodale he was determined to have nothing to do with a rising, and it was upon a generous impulse, touched by the forlornness of the royal adventurer, that, against his better judgment, he decided to throw in his lot with Charles. Following Lochiel�s lead the other chiefs came in, and the standard was raised at Glenfinan. Throughout the rising it was his influence which restrained the Highlanders from acts of plunder and violence. On one occasion during the march to Derby, an Englishwoman who had hidden her boy in terror of the cannibal habits which were attributed to the Highland army, exclaimed as Lochiel entered her house, "Come out, my child, this man is a gentleman; he will not eat you! " Among other things it is said Lochiel prevented the sack of Glasgow, and for this reason the magistrates ordered that whenever Lochiel should visit the city he should be greeted by the ringing of the bells. When the Jacobite cause was finally lost at Culloden he was severely wounded, but he escaped to France, where his royal master gave him command of a Scottish regiment. He died abroad in 1748. The events of that time are commemorated in the well-known piece of pipe-music, "Lochiel�s away to France." It is pathetic to remember that the last victim of the Jacobite cause was Lochiel�s brother, Dr. Archibald Cameron, who was arrested on the shore of Loch Katrine during a mission to this country when the Rebellion was over, and was tried and executed as a deterrent. Another member of the clan who figures scarcely less notably in the literature of that time is Mistress Jean Cameron. This lady, as tutor for her nephew, Cameron of Glendessarie, in person brought a large body of the Camerons to join the Prince�s Standard at Glenfinan. The Hanoverian annalists of the time, like Ray, have taken outrageous liberties with her reputation. Many writers, like Fielding in his Tom Jones, make suggestive references to her career. It is certain, however, that at least one other individual traded upon and besmirched her name. This person, according to Chambers� Traditions of Edinburgh, represented herself as a cast-off mistress of the Prince, and after imposing upon the sympathies and support of Edinburgh Jacobites, died in a stair foot of the Canongate. She masqueraded in men�s clothes and had a timber leg. The actual Mistress Jean Cameron of Glendessarie, however, had a character above reproach. She was a good deal older than the Prince. In later life she settled at Mount Cameron in East Kilbride, and, according to Ure�s History of that parish, she died and was buried there in all the odour of respectability. The grandson of the Gentle Lochiel, another Donald Cameron, was a Captain in the Guards, and married the Lady Vere. His descendant again, the father of the present Chief, married a daughter of the fifth Duke of Buccleuch. And the present Chief himself, who succeeded in 1905, married Lady Hermione Graham, daughter of the fifth Duke of Montrose. Lochiel has had a distinguished career. He served in South Africa during the war in 1899 and in 1907-2. In 1901 he was aide-de-camp to the Governor of Madras; and he was a Captain in the Grenadier Guards till his marriage in 1906. He has also essayed politics, having contested Sutherlandshire in the Unionist interest in 1910. In all matters in which the welfare of the Highlands is concerned he takes an active part, and in the great emergency of the war of 1914 he came forward in a fashion worthy of his ancestors and characteristic of the Cameron clan, and raised four additional battalions of Cameron Highlanders for active service. One of these he himself commanded, and the esteem in which he is held was proved by the fact that the men required came forward to join the colours withjn a few days after the announcement that Lochiel had received the commission. Among other achievements, he led his Camerons in the tremendous charge at Loos in which his two brothers and so many clansmen fell. It is amply evident that the present Cameron Chief is as loyal and as active in his country�s service as any of his ancestors, and against his name there falls to be written yet another most notable chapter in the history of the clan. Septs of Clan Cameron: Chalmers, Clarkson, Clarke, Kennedy, MacGillonie, MacChlery, MacKail, Macildowie, MacMartin, MacOnie, MacOurlie, MacPhail, MacSorley, MacUlrie, Macvail, MacWalrick, Martin, Paul, Sorley, Taylor. Highland Camerons have long been associated with Lochaber and are said to have derived their surname from the "Cam-shron" or "wry-nose" of an early chief who was claimed to be the younger son of the King of Denmark. The first recorded chief was Donald Dubh in 1411 and from him the clan take the chiefly patronymic "MacDhomnuill Duibh", son of Black Donald. The Cameron clan consisted of three main branches: the MacMartins of Letterfinlay, the MacGillonies of Strone and the MacSorleys of Glen Nevis. The main branch appears to have been the MacMartins and through intermarriage with the MacGillonies, the Camerons of Lochiel gained their lands in Lochaber and latterly the chiefship which they still hold to this day. The present chief being Colonel Sir Donald Cameron of Lochiel. During the early days of the clan system the Camerons were followers of the Lords of the Isles and fought at the Battle of Harlaw in 1411. From the early 17th century the clan were loyal supporters of the Royalist cause for which in 1746, as a result of their continued support for Prince Charles Edward Stewart, their lands were forfeited. Their famous chief of that time, the Gentle Lochiel died a hero in exile after having both his ankles shattered by grape shot at Culloden. 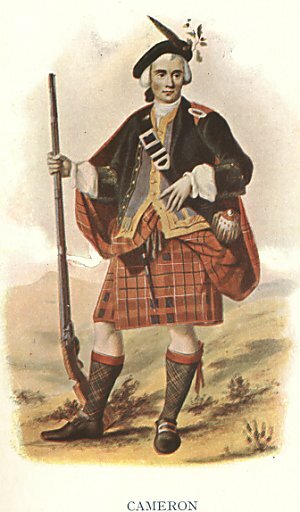 The lands were subsequently restored and in 1793 a cadet of the Lochiel branch Cameron of Erracht, raised the 79th Cameron Highlanders, famed for their bravery in battle. for letting us post up the first 21 pages of this book and hopefully we will get more of it at a later date.